Mash and sieve your favorite foods with the Weston Potato Ricer. This handheld Stainless Steel Potato Ricer is great for making perfect mashed potatoes, homemade baby food, and flawless purees. 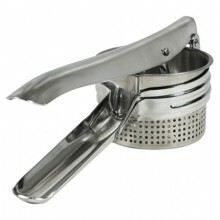 Click the button below to add the Stainless Steel Potato Ricer to your wish list.